Tennoji is located in the southern part of Osaka city. Tennoji is home to the Shi-Tennoji temple, which was dedicated to four heavenly kings in 593. This is the oldest official temple in Japan. The five-story pagoda is a beautiful structure that houses an image of the Bodhisattva Kannon. A walk around the temple in spring will also allow you to see the spacious Gokurakujodo garden filled with blooming cherry blossoms. A more modern view of Japan comes with the Abeno Harukas, Japan’s tallest building at 300 meters. At the top is an observatory where nearly the entire city of Osaka can be seen. After soaking in all of Osaka city from the top floor, you can travel down to the lower levels and go shopping at a variety of shops. Due to Tennoji only being four train stops away from Osaka’s downtown, Osaka specialities are abundant here. 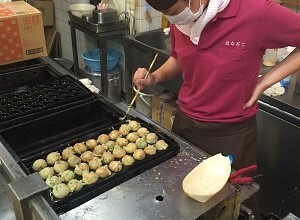 One famous dish, takoyaki, is eaten amongst locals regularly. Takoyaki are fried dough balls with tender octopus bites in the center. These dough balls are smothered in a special takoyaki sauce, mayonnaise and fish flakes. Beware of your first bite—they’re always served hot! When I was given a chance to have a job interview and do a demo lesson, I found teaching at AEON appealing and worth trying. I especially liked the ways to teach non-native speakers of English with communicative approach based on their knowledge of English grammar, which seemed truly effective. Head teacher’s duties include various kinds of tasks. In addition to co-operating with the managers with regard to business, we are required to provide support and advice to the teachers and make efforts to satisfy the students from all sides, for example, offering a pleasant study environment, student-care including various counseling sessions as well as quality lessons. My advice is to think “you are not alone”. You will be able to obtain assistance from the people around you if you are willing to assist them! I am sure that you can enjoy cross-cultural communication with people around you and that you can learn a lot from your students and grow as a person through teaching at AEON.